Head torches are an essential piece of kit for any outdoor adventurers, fell runners, hikers, watersports enthusiasts or weekend campers! 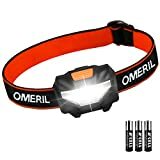 These small but extremely powerful torches are mounted on a headband to improve your visibility and allow you two free hands to perform a task rather than worrying about holding a flashlight. Not only do they help you see where you’re going, and make the activity easier and safer, but they also allow other people to see you. This is crucial for any mountaineer, trail runner or those who are out on the water. The quality and performance of a head torch can be paramount to your success and safety. As a result, weight, durability, brightness, ease of use, cost, comfort and stability are all factors that should be taken into account when deciding on the best head torch to buy. Check out our handy guide of the best head torches for outdoor adventures! So what should you take into account when looking for a head torch? Consider your budget and the key features of the torch that you can’t do without. If you’re a keen athlete that will need to train after dark on a regular basis, then it’s definitely worth investing in something a little pricier that you know will deliver. Runners will likely need to outlay a little more to get a strong, wide beam that allows them to see everything clearly despite travelling at speed, whereas torches for a kids’ camping trip are a little more flexible. Head torches can cost as little as five pounds for something basic or upwards of 100 if you’re getting all the bells and whistles. For a camper, a solar-power head torch might be useful but for a night fisher, this costly extra will be totally redundant. Instead they may opt for a red LED capability or a further beam distance. This one is simple and will generally go hand-in-hand with price. Outlaying a little more on a head torch will equate to a more reputable brand, better quality build and materials, and a longer life. Your torch will be able to withstand temperature changes, a few drops and knocks and you can even opt for something waterproof. Ideally your head torch needs to be at least an IPX4 which means it’s splash proof, anything more is a bonus, but anything less means it’s unlikely to survive more than a few outdoor trips. Once you’ve figured out your budget and primary use, the power of your head torch beam will be the next biggest factor. Without getting too technical, the brightness of head torches is measured in lumens, which is the amount of visible light that our eyes can detect. Previously it was measured in watts – units of power – but this new labelling gives greater clarity around what and how far you’ll be able to see. Head torches vary from 20 lumens all the way to over 1000 lumens. Naturally, the lower end will allow others to see you and give you basic lighting, and the upper end of the range can flood light a path or river in front of you. Torches over 1000 lumens rapidly deplete battery and are likely to be unnecessary for an everyday user. Most head torches offer a dimming function, allowing it to be multipurpose, and also useful when needing to switch between looking at a map, a phone screen, a dark trail and moving through fog – which reflects back a lot of light. Head torches also offer three types of light output. Cheaper torches will have unregulated light output, starting brightly but exhibiting brightness decay fairly rapidly as they burn through power. On the flip side, regulated light output head torches show little variation over their battery life, which offers the user a reliably bright output. At the top end of the market is a new breed of torches with managed light output, that sense and monitor incoming light and adjust their brightness accordingly, and can be managed via Bluetooth and a phone app. Needless to say – most users won’t need anything quite this impressive, but it’s still worth knowing that it’s an option. As a general rule, you’ll want up to 100 lumens for running in partially-lit urban areas, up to 300 lumens if you need cars to see you from a distance, and over 300 lumens if you are running or cycling on unlit trails. For anyone used to working in watts, a 60W bulb would equate to around 700-750 lumens. Continuing on from brightness, users may also need to take into account the beam distance. 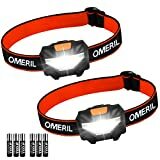 Head torches will either have one powerful LED or numerous less powerful LEDs. Those with a single LED produce a longer distance focused beam, better to suited to those traversing unlit trails. Beam distances are always listed and range from just a few metres up to a few hundred metres. However it should be noted that although 200+ metres sounds impressive, it’s not particularly useful. 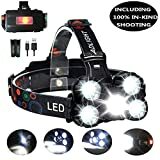 Virtually all head torches will come with three modes at the very least, normal white light, flashing white light and a red light. A red LED feature is perfect for activities in dark spaces where you’re only using your head torch for temporary bursts, as the red light does not affect your natural night vision with those blurry white spots. A white flashing LED feature may seem like it’s reserved for cyclists but it can be a lifesaver in an emergency. Some head torches also have a tail light, which is great for cyclists or runners that travel together in groups. Super-bright head torches will typically have a shorter battery life. What you need to look out for is how long the battery will last at the advertised number of lumens. Just remember that, depending on the output type, the battery life will refer to how long the light will last until it totally dies, but this may be at a diminished level of brightness. Long-distance runners, cyclists or those out on extended camping trips may also want to consider buying additional rechargeable batteries to sub in and out. Where possible, rechargeable batteries are always preferable to standard alkaline batteries as they are more efficient and hold up better in low temperatures. A brighter light and multiple functions will generally come with a weight penalty. When worn for extended amounts of time, you’ll really notice the difference in weight and this will be crucial for athletes. For campers that need to potter around in the dark, or those going for a leisurely after-dark kayak, something a little bulkier will be fine. Alongside the actual weight, consider the weight distribution of where the batteries sit vs the torch itself, as well as where the straps fasten or buckle clasps. For athletes and adventurists on the go, you should be able to lightly shake your head without the head torch coming loose. Depending on the activity, many users opt for an overhead strap for additional comfort and security. Some torches offer extensions so that battery packs can be tucked into a vest or back pocket. You may be asking “How hard can a head torch really be to use?” Well, try running along uneven surfaces in the dark with running gloves on and cold fingers, and you might find that the design and ease of use are suddenly crucial. On the flip side, if the buttons are too easy to press, it may turn on when bumped in your bag and you’ll pull it out to discover a drained battery. So now you know what to look for, read on to find out about some of our favourite head torches on the market right now! The Silva Trailer Runner II doesn’t come cheap but its combination of epic light output, decent battery life and easy to use controls make it well worth the investment. Unlike some of our other contenders, this head torch is truly versatile for all fast-moving sports, with incredible brightness perfect for running, mountain biking  – it comes with helmet and handlebar mounts – and even night skiing meaning that it’s great value for money. The Trail Runner II is an upgraded version of the previous model with a greater light output, comfier headband and other tweaks. Two LED lights provide up to 660 lumen beam output, designed with Silva’s ‘Intelligent Lighting’. One light is wide angled for peripheral vision, whilst the other provides a bright spotlight for distance vision – something designed with movement in mind. The main beams are easily tilted up and down, allowing the user to adjust height and beam distance, offering a wide and penetrating field of light and reducing the tunnel vision effect found on cheaper torches. Although the flood light is not as good as some of its competitors, it offers the best of both without having to constantly switch between modes. This is also easily counteracted by switching to high brightness mode – sacrificing some of the battery life in the process. The Trail Runner II has three modes: strobe (activated by a long press), wide and spot (quick press) and wide only (quick press twice). Switching to wide only is easily done to avoid blinding oncoming trail, run or river users, a bit like dipping headlights on a car. Although there is no built-in taillight, the battery pack has a small slot for a flashing red Silva Tyto light if needed. A major point of praise is its user experience, with a large button on the side of the lamp easily operated, even in cold weather whilst wearing gloves. It also comes with cold weather-friendly remote battery options and switching off requires a long click, reducing the chance of annoyingly accidentally switching it off whilst on the move. The Trail Runner II utilises a rechargeable battery pack of three AAA batteries that supply eight hours on medium power – more than long enough to get you down the river or hillside, or along the unlit running trails. The unit itself is relatively light at just over 120g, or just over 240g if adding the Siva Tyto (tail light). The majority of the weight is concentrated in the padded battery pack which sits at the back of the head, balanced out by the torch at the front and providing little bounce or movement even when running. With the added option of extending the cable to wear in a pocket or bum bag, users can switch it up to whatever is most comfortable. Building on the success of the previous Silva Trail runner, this model is sturdy and well-constructed and is also IPX6 splash proof rated. This means that while it is unlikely to survive a swim in the river but would withstand a light rain shower. For those who like the head torch but are wanting something for kayaking, canoeing, etc. then Silva’s range offers some with full waterproofing. The wide headband with silicone rubber strip reduces movement or slipping and relieves concentrated pressure so that it can be worn for extended periods of time without discomfort. It can also be removed for washing and the battery pack is coated in a soft padding that sits nicely at the back of the skull. Relatively expensive…but well worth the money! This cheap and cheerful head torch may look like its for kids only, but it’s actually one of the best options on the market in terms of being a true all-rounder. The Alien Scout head torch is a little comical by name when compared to its counterparts but it is shockproof, waterproof, easy to use and pretty sturdy. 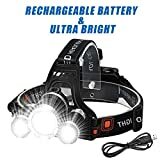 This lightweight and ultra-bright head torch would serve its purpose for anyone engaging in camping, cycling, basic fishing, dog walking, rambling, etc. Alien Scout’s head torch features a powerful 168 lumens spotlight designed to shine light up to 100 meters. but due to its low price, the design doesn’t match up to some of our other competitors. Because of the way the LEDs are laid out, most of the light is centred in one spot and there is no way of differentiating between spot lighting or peripheral. However, as mentioned, this head torch is more targeted towards camping and low-speed movement activities, so it shouldn’t be a big issue. As you might expect, there are just three main modes on this head torch – white, red and SOS modes. Within these, there is red night vision, red flashing, white ultra bright and white flashing. For an everyday user this would certainly be sufficient, and with fewer modes comes a greater ease of use – being able to switch between functions with just a single click of the button. The light can be turned off without having to circle through all settings by just pressing and holding. The torch comes with long-life Duracell batteries, but it would be worth investing in some rechargeables to maximise efficiency. The manufacturer claims up to 120 hours of life on a single set of batteries, although we believe it sits somewhere around the 25-30 hour mark, depending on how often you change settings. Based on its price and manufacturer, you wouldn’t want to count on this torch to las you a lifetime, and it’s certainly not cut out for athletes, but it will certainly do the trick. It is by far the cheapest option for those looking for something waterproof – being able to survive brief submersion in shallow waters, and definitely holding up to repeated splashing or a rain shower. As a result, those taking to the waterways would see this as a good investment. One downside is that the on button could be bumped and switched on within a bag, but the torch does come with a portable hard case to counteract this, and also increases its longevity for storage purposes. The Alien Scout head torch can be tilted to focus on the path, river or slope in front of you, or it can be pointed straight ahead, although we found it actually aimed a little skyward due to the way it rests on your forehead. The rotatable body can turn up to 70 degrees and the strap can easily be tightened on the move without fiddling around with complex straps or clasps. The case is a nice addition with designated space within for storage of spare batteries and a carabiner to allow you to clip it onto a backpack or inside a tent. The removeable head strap is also a plus, although a little extra padding where the torch rests on the forehead certainly wouldn’t have gone amiss. This product recently fell from the £60 mark to just over £10 and we can’t quite believe it. Boruit’s rechargeable head light offers four modes and it can also be used as a bicycle lamp. The Boruit’s brightness sits around the 3200 lumen mark. Rather than a strong single beam, the element consists of three T6 LEDs with a max output of 5000 lumen, although this would decrease steadily as the battery life begins to deplete (and with all three beams on, it’s likely to be a quick process). On full beam the torch has a lighting distance of 200 metres, so for runners and those looking to use the full beam for an hour or less, the Boruit would have more than enough power to light the way. The Boruit is a multi-functional head torch, with the makers claiming its perfect for virtually any purpose or sport. We found that it’s good for running, but due to its weight, elite runners and serious athletes would probably look elsewhere. However, thanks to its ability to be separated from the headband, it functions as a great bike light. Equally, it would be perfect for camping, due to its ability to change between light types and levels. Users can press once for one mid LED, twice for the four side LED, three times for extra brightness with all five LEDs or four times for the strobe setting. Switching between the functions is relatively easy as there is just a single button for all controls although this can slightly elongate the process of switching between the first light functions and the flash setting or turning it off – but we figured this was a small price to pay for the huge cost saving. An adjustable base is provided, with a back tilt of 90 degrees, allowing the wearer to focus the light where it is most needed – perfect for lighting up the ground whilst moving at speed on a bike. The torch is powered by three 18650 rechargeable batteries. The charge time is about five hours, with a useage life of between one and two hours, depending on the modes and brightness selected. As mentioned above, it’s not exactly the lightest head torch on the market, but one bonus of this is that the sturdy torch body feels like it could take a few knocks and drops and come out unscathed. The Boruit is just under 500g with batteries, constructed from durable aluminium alloy material and toughened glass anti reflective lenses. Another bonus is that it is IPX4 waterproof, providing enough protection from splashing water from all angles and would give you enough time to duck out of a rain shower without ruining the device. Boruit’s LED lifetime claims to be around 100,000 hours, meaning it has a fair bit of life in it. The Boruit got our pick based on its value for money for everyday users, and the fact that the head torch also comes with a wall charger, car charger, USB cable clip, carrying case and rechargeable batteries. Founded in Germany by two adventurist brothers, Ledlenser is an internationally-respected torch brand used by professionals and dedicated enthusiasts alike. This torch sits around the middle of the price range and holds up well in a multitude of settings from walking the dog to working traversing the seas. Relatively light, stylish and packed with high-tech features, Ledlenser’s SEO5 Head Lamp is clearly well thought through to look distinct and perform efficiently. Not many torches in this price bracket offer Smart Light Technology (SLT) – including the provision of power, low power, and signal light options. The SEO5 incorporates a premium light chip that delivers an impressive 180 lumens from three AAA batteries. The micro-chip controls the Smart Light Technology system mentioned above and enables power brightness, dim lighting or signal light options to be selected depending on the surroundings and preserves battery accordingly. Users are also provided with the option of either flood beam – for near – or a sharply-focused spot beam – using a reflector and lens combination for distances – and the swivelling head lamp allows for useful directional lighting. The comfortable, hands-free LED head lamp includes three key light functions are power, low power and defence strobe. The SEO5 also offers glare-free red LED which helps protect users’ night vision and the lamp can be quickly zoomed using a twisting motion, ideal for runners or cyclists that may need to switch between near and far distances on the move. Additionally, the light can be tilted without having to tilt the entire unit, allowing it to still sit comfortably and well-balanced on the heard. Another feature we liked is the torch’s integrated transport lock to prevent the lamp accidentally switching on and unnecessarily draining the batteries. The head torch comes supplied with three AAA batteries, and in total weights just 200g. This makes it much more suitable for sports and activities that involve movement than the slightly cheaper Boruit. In terms of battery life, the Smart Lighting allows it to make the most of its energy stocks by not outputting more light than it needs – unless otherwise defined by the user. Dependent on setting, the SEO5 could last anywhere between one and three hours. Ledlenser products are built to last, and are made with good quality parts with modular construction. The bonus of this is that should a replacement part be required, the whole torch doesn’t need to be discarded. The head torch is also IPX5 water resistant, so although it won’t take submersion well, it can withstand a few splashes. This makes it more suited to the trails or camping than sailing, kayaking, etc. The adjustable headband (made from anti-allergenic material) can be removed and washed, which is a real bonus for athletes and adventurists that are using it through the hot summer months. For extra piece of mind, the device also comes with a belt hook included and the casing glows when in use, allowing the user to see and be seen. This head torch is the best choice for anyone looking for the perfect combination of price, weight, brightness and battery life. The NAO is Petzl’s latest super-sophisticated and self-adjusting head torch. NAO offers users an ultra-powerful multi-beam head torch with over 750 lumens of power but unlike cheaper torches, can output reliable light levels throughout its battery life. This model improves on Petzl’s 2014 version with almost twice as much light output. Going one up on our previous torch, the NAO features reactive lighting technology that automatically adapts light intensity to user needs and the surrounding environment. 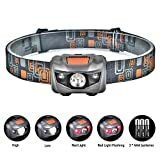 This rechargeable headlamp is programmable via the MyPetzl Light app for smart phones or functions as a normal head torch if preferred, switching between programmes with the twist of a switch. 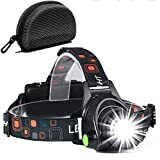 The head torch offers two brightness settings, on the higher of which users are able to light up a significant area in front of them, allowing them to move at speed over uneven terrain without any issues. On the lower setting there is enough light for slower movement and the smart lighting adjusts so that when the user looks up from close to distant objects, the NAO’s output will adjust. Alternatively the light can be set to constant lighting with two fixed brightness settings. As well as being able to adjust the light levels via the mobile app, this torch is programmable by plugging it into a computer allowing the user to manage the brightness and burn times according to their activity type and duration. Unlike torches with fiddly small buttons, the NAO offers a large twist button that can be used even with thick gloves. Twisting for a long or short amount of time will select constant or reactive lighting and either high or low brightness. NAO’s ability to cleverly change between settings based on ambient light levels means that changes needed are minimal so the user can concentrate on their activity. Petzl has also invested time and money into ensuring their newest model offers improved battery life. Charging the battery takes hours about four or five from completely flat and with the light on full power the NAO offers you full power for about 1 hour 30 minutes, which is plenty of time for an extended run or ride. On the constant low brightness, the battery can run for an incredible 7.5 hours. As you might expect, running the Bluetooth on the torch will slightly decrease its battery life. The battery pack is located on the back of the headband, counterbalancing the weight of the torch on the front. As clever as the reactive lighting is, one major downside is the necessary size of the light unit which is a bit bulkier than some of its counterparts. As a result, some runners may prefer to opt for something lighter, but we doubt it would be of an issue to most sports and activities. Some users have suggested that the on/off switch doesn’t feel as sturdy as previous models, but on the whole we’ve found the unit to be well-made and likely to last quite some time. One of the standout features, as previously mentioned, is the MyPetzl Light mobile app. Users can download profiles provided by Petzl or create their own personalised ones, as well as being able to track remaining burn time and adjust headlamp performance accordingly. British Adventurer Abseils Into Active Volcanos! How Do You Test Superglue? Glue Your Feet to a Hot Air Balloon!